Everyone reading this post with their BFF, I just want to say this: I'm really happy for you, but Kanye West and Taylor Swift officially have the best #FriendshipGoals of all time! On Saturday, Sep. 4, the reigning Queen of #SquadGoals shared a picture on her Twitter account of a gorgeous hedge of white roses that were courtesy of none other than West. Swift captioned the photo: "Awww Kanye sent me the coolest flowers! #KanTay2020 #BFFs." Not only did Swift offer arguably the best political campaign slogan imaginable via hashtag, her tweet cements the glorious fact that the two stars have been able to bring their relationship full circle. Many a fan remembers the fateful night in 2009 when West rushed the stage at the 2009 MTV Video Music Awards after Swift won the award for Best Female Video. 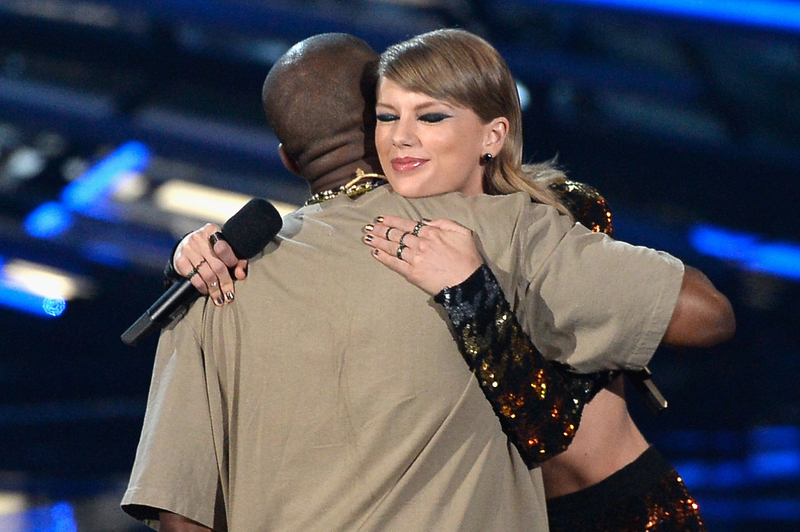 After wrenching the microphone from Swift's hand and proclaiming, "I'mma let you finish, but Beyoncé had one of the best videos of all time," the two didn't exactly become the fastest of friends. Any speculation on remaining "bad blood" between the two was definitively quashed during the 2015 VMAs, when Swift presented her "friend" with The Michael Jackson Vanguard Award. Swift and West embraced, West made a heartfelt apology to the "Shake It Off" singer during his speech, and bids for a West/Swift presidency made Twitter explode. Let's take a look at the five reasons these two crazy kids are the ultimate #FriendshipGoals — as if you needed that many reasons. While Swift's ever-growing squad is close to including every famous person imaginable, West has been keeping up with the Kardashians, Beyoncé (duh), and Jay Z among others. Next time you're having a so-called argument with one of your friends, ask yourself this: "Did they — fueled by a belly full of Hennessy — steal a microphone from me?" "Did they interrupt one of the most pivotal moments of my life?" Even if they did, that doesn't mean your relationship can't prevail. Swift and West have taught us that true friendship can overcome almost any obstacle. Although Swift and West have decidedly different personalities, one thing they both exude is confidence. Their fierceness and refusal to back down on an issue they believe in is inspirational. I would love to be a fly on the wall during one of their discussions. Ugh, the FOMO! The different facets of their personalities actually make Swift the perfect yin to West's yang — or vice versa. In all seriousness, it's really nice to see that Swift and West have been able to "shake it off" when it comes to their previous tension. I, for one, will be keeping my eyes glued to each artist's social media feeds in hopes of more squee-worthy moments between these two pals.